Epworth United Methodist Church in Rehoboth Beach DE . Comparative texts about Pharisees & Sadducees from Joephus, Tosefta, Mishnah & Babylonian Talmud. Comparative primary texts about Purity and Social Relations (see esp "Tax Collectors Visit," from Mishnah, Midrash, Tosefta, and Babylonian Talmud. At Mahlon H. Smith's (Rutgers University) Into His Own: Perspective on the World of Jesus. "The Pharisee & the Publican," Luke 18:9-14, Martin Luther, c. 1522. "Two things especially make our prayers void and of no effect: confidence of our own righteousness, and our contempt of others; but a humble heart is contrary to both of these." "This parable was to convince some who trusted in themselves that they were righteous, and despised others." The Pharisee and the Publican (Luke 18:14): sermon by George Whitefield. "The Pharisee here mentioned was no hypocrite, no more than an outward adulterer: but he sincerely trusted in himself that he was righteous, and accordingly told God so, in the prayer which none but God heard." "'This parable teaches us the spirit that should pervade our prayers. The first parable encourages us to pray, and faint not. The second reminds us how we ought to pray. Both should be often pondered by every true Christian.'--Ryle." "Paul Tillich, commenting on the Apostle Paul's assertion that the gospel is a stumbling block, once said that the danger is stumbling over the wrong thing." Commentary, Luke 18:9-14, Meda Stamper, Preaching This Week, WorkingPreacher.org, 2013. "This week’s text follows immediately on last week’s and is another parable about prayer." "So perhaps the best way to preach this clever and dangerous parable is to keep all talk of the Pharisee and tax collector and Luther and ourselves and anyone and everyone else to an absolute minimum. Instead, perhaps we should reserve most our time, thought, and words for God." "How radical are the implications of Luke’s reversal of social power for the traditional hierarchies that structure our contemporary life!" "Thirst, a Word for Prayer," Nancy Rockwell, Bite in the Apple, 2013. "Prayer is mysterious. What is it? Who hears it? Why do we do it? Why do we not do it? Why are we are drawn to it, interested in the Dalai Lama or the Pope? Why are we so uncomfortable with our own prayer?" "Slavery and Freedom," Janet H. Hunt, Dancing with the Word, 2013. "A Pharisee and a Tax Collector Went Out into the Garden," Andrew Prior, 2013. "Self Righteous Idiots," Roy M. Terry, IV, The Hardest Question, 2013. "Who is actually the bad guy in this text?" Commentary, Luke 18:9-14, David Lose, Preaching This Week, WorkingPreacher.org, 2010. "This parable is therefore preached well only to the degree that each time we try to interpret it we find ourselves, yet again, with nothing to claim but our dependence on God's mercy." "First Thoughts on Year C Gospel Passages in the Lectionary," Pentecost 23, William Loader, Murdoch University, Uniting Church in Australia. "The message of Jesus is quite sharp: bolstering one?s sense of identity by disparaging others (even when they are terrible sinners) so easily leads to illusions of grandeur and a failure to see ourselves as we really are." "The Parable Trap," Russell Rathbun, The Hardest Question, 2010. "Is the Pharisee?s self-justification built on the Law or on his comparison to others? The text is explicit about his comparison to others. A Pharisee, however, would find righteousness in the Law. I think this distinction matters." "We are the crown of God's creation. Each one of us has been gifted by God. So -- how can we promote godly self-esteem without self-exaltation or arrogance? And how can we promote humility without self-degradation or shame?" "You were thinking that this story is fine as a start, but, in the future, we expect some amendment of behavior on the part of the tax collector. In other words, while the pharisee is clearly going overboard, we want the tax collector to start acting like one anyway." A Hitchhiker's Guide to the Gospels, Andy Doyle, 2010. Comentario del Evangelio, San Lucas 18:9-14, Gilberto Ruiz, WorkingPreacher.org, Luther Seminary, 2010. "En esta parábola, Jesús escoge a un fariseo y un publicano para comunicar la enseñanza de 18:14." Holy Textures, Understanding the Bible in its own time and in ours, Luke 18:9-14, David Ewart, 2010. "The bumper sticker we all should have on our cars is: 'God loves you, so start living this love (and stop being a jerk)' This is the transformation the tax collector experiences in this parable." "Why this threat of humiliation for the lofty living Pharisee and the reverse for the tribute collector?" "People of Jesus' day would have been surprised to see a respected religious professional showing his arrogance like this. What would people of our day think of us if and when we allow a hidden arrogance to show, however briefly?" "Praying for a Change," study guide, Robert B. Kruschwitz, (other resources at) "Prayer," Christian Reflection, The Center for Christian Ethics at Baylor University, 2009. Focus articles: "Praying for a Change," Todd Edmondson, "Prayer in Eclipse," Ken Massey, "The Orant," Heidi J. Hornik. "Humility: An Example of Faith," The Politics of God: The Way to the Cross, Eugene C. Kreider, Texts in Context, Word & World, Luther Northwestern Theological School, 1986. "God is free to respond to a sinner's plea for mercy with justification. God is not bound by human claims or by the expectations of religious tradition." Wellspring of the Gospel, Ordinary 30, Catherine McElhinney and Kathryn Turner, Weekly Wellsprings. "Do you compare your prayer and life-style with others - so that you come out best?" "The Pharisee and the Tax Collector," Rev. Bryan Findlayson, Lectionary Bible Studies and Sermons, Pumpkin Cottage Ministry Resources. "Piety, Persistence, Penitence and Prayer," a study from the Biblical Studies Foundation. "The parable of the Pharisee and the publican provides us with valuable insight into the very recent preoccupation with self-esteem." "Pharisee and the Publican," wikipedia. Blake, Eugene Carson, "Prayer and Morality," Theology Today, 1972. Bondi, Roberta, "Sin of Scorn," The Christian Century, 2004. Cortés, Juan B., S.J., "The Greek Text of Luke 18:14a: A Contribution to the Method of Reasoned Eclecticism," The Catholic Biblical Quarterly, 1984. Downing, F. Gerald, "The Ambiguity of 'The Pharisee and the Tax-Collector' (Luke 18:9-14) in the Greco-Roman World of Late Antiquity," The Catholic Biblical Quarterly, 1992. Duke, Paul D., "Praying with a Sideward Glance," The Christian Century, 1995. Friedrichsen, Timothy A., "The Temple, a Pharisee, a Tax Collector, and the Kingdom of God: Rereading a Jesus Parable (Luke 18:10-14a)," Journal of Biblical Literature, 2005. Hamm, Dennis, S.J., "The Tamid Service in Luke-Acts: The Cultic Background behind Luke's Theology of Worship," The Catholic Biblical Quarterly, 2003. Harrison, Stephanie, "The Case of the Pharisee and the Tax Collector: Justification and Social Location in Luke's Gospel," Currents in Theology and Mission, 2005. Kodell, Jerome, O.S.B., "Luke and the Children: The Beginning and End of the Great Interpolation (Luke 9:46-56; 18:9-23)," The Catholic Biblical Quarterly, 1987. Linss, Wilhelm C., "Example Stories," Currents in Theology and Mission, 1990. Luti, J. Mary, "General Principles," The Christian Century, 1998. West, Audrey, "One-Upsmanship," The Christian Century, 2007. "Prayers to God," Laceye Warner, Faith and Leadership, 2008. "A Satisfactory Humility," the Rev. Robert M. Holmes, Day 1, 2001. "The Pharisee and the Tax Collector," Pastor Edward F. Markquart, Grace Lutheran Church, Seattle, Washington. "Headed for a Fall," Charles Kirkpatrick, Sermons4kids.com. "The Pharisee and the Publican," children's study, puzzles, coloring sheet, etc. Higher Praise Christian Center. 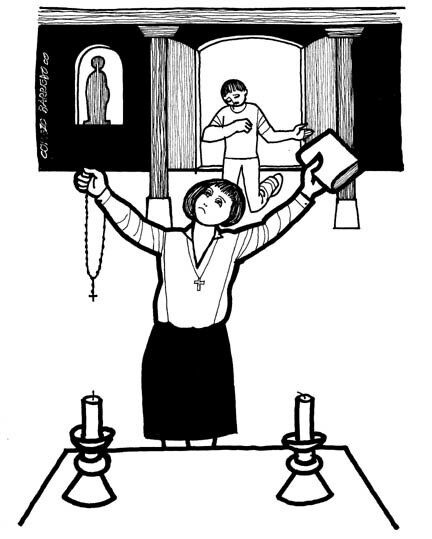 "The Pious Man and the Scoundrel," from A Certain Jesus by Jose Ignacio and Maria Lopez Vigil. Ideal for catechetical and liturgical dramatization of today's gospel. Claretian Publications. Clip Art, Luke 18:10, Fr. Richard Lonsdale, Resources for Catholic Educators. Luke 18:9-14 at Cerezo Barredo's weekly gospel illustration. Liberation emphasis. Clip Art: The Pharisee and the Tax Collector, Julius Schnoor von Carolsfeld woodcuts, World Mission Collection, Wisconsin Evangelical Lutheran Synod. Hymns with Scripture Allusions: Luke 18:13. The Cyber Hymnal.